In the past we have written many posts about StarWind Virtual SAN (VSAN) detailing different scenarios and benefits, however privileging mostly 2-nodes setup for their low cost and easy to build. However, StarWind VSAN can easily be expanded to 3 or more nodes (up to 64 actually, which is a current limit of vSphere clusters). Those hyper-converged scenarios are fully supported by StarWind. So StarWind VSAN on 3 ESXi Nodes detailed setup is only a logical follow if you like, and this is a topic of today’s post. In fact, we won’t be detailing the actual step-by-step as StarWind engineers have already done that here. But we will highlight parts of the building process and note some details which might interest people willing to go this route. Please note that while StarWind VSAN on Linux has been recently announced the 3-nodes setup guide from StarWind is actually using Windows Server nodes, and the hypervisor isn’t the latest 6.7 but 6.5. This isn’t a problem as there aren’t many (or any) changes to networking setup between ESXi 6.5 and 6.7. Concerning storage performance, the local storage can be a mix of SSDs, HDDs where the SSDs are configured for level 1 cache. StarWind uses conventional RAM as a write buffer and Level 1 cache to absorb writes. What’s the StarWind 3-Nodes ESXi Architecture looks like? We have borrowed this image from StarWind’s article. Basically, you can see that you’ll be creating two datastores visible by all 3 ESXi hosts. The networking is separated by subnets and uses 5 NICs (1 for management, 2 for data, 2 for sync) on each ESXi host. Before we’ll dive into the scenario, let’s recap some benefits of using StarWind hyper-converged solution which will carve the local disks from each node and turn them into a storage pool. StarWind Fault-Tolerant Storage and Benefits? Two nodes and more – Scale-out is possible with up to 64 nodes. Flexibility – it’s possible to tailor for almost every situation/hardware. Windows or Linux based – This year StarWind released the long-awaited Linux version which can save an additional license of Microsoft Windows server. Multi-Hypervisor support – as you’ll be able to check below, StarWind now supports multiple hypervisors. Whether you’ll need NFS, iSCSI or SMB v3 for Hyper-V, StarWind can be your choice. 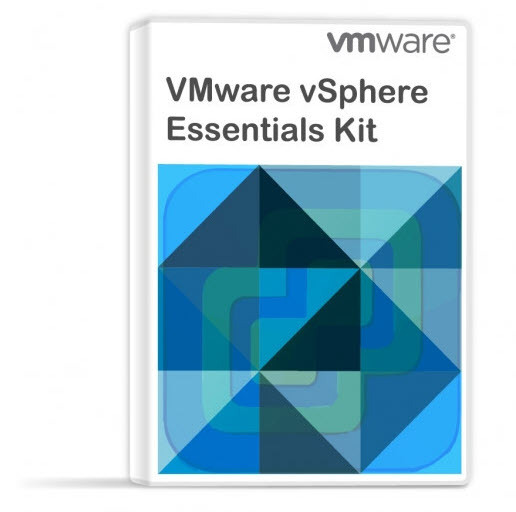 So you don’t have to use VMware vSphere as the underlying hypervisor. The main step-by-step will provide with all you need. All tweaks and configurations are listed in this detailed article. Basically, after installing ESXi, you’ll need to configure the networking on each ESXi which will be used by StarWind. You’ll be creating two vmkernel ports and four portgroups per ESXi too. After the networking, you’ll be doing some work through the VMware vSphere console (not mandatory as you might already have the structure of datacenter > cluster > hosts, already in place). Next part is the StarWind Installation and configuration. There you’ll be doing the basics like creating the HA devices (high available storage) through the StarWind Management console. Replication and heartbeat networks have to be assigned through the console as well. Then you’ll create replicas. When done, you’ll create iSCSI targets and configure vSphere iSCSI initiators > create datastores > assign vSphere storage policy (Round Robin) > do some additional tweaking. As being said, the step-by-step is very detailed an additionally, from the same blog post you can also download a Technical PDF with identical setup steps. StarWind Virtual SAN Free is completely unrestricted: it is allowed for production use, supports all usage scenarios of the commercial version, has a perpetual license, and is not feature- or functionality-limited version of StarWind VSAN. No Time Limit on License – The Free license if for life. After 30 days, the only management option you’ll have is PowerShell or CLI. Production use – can be used in production, but if anything goes wrong, you will only find support through community forums. PowerShell Scripts – StarWind Virtual SAN Free is shipped with a set of ready to use PowerShell scripts allowing users to quickly deploy the Virtual SAN infrastructure. No StarWind Support – only community-based support. 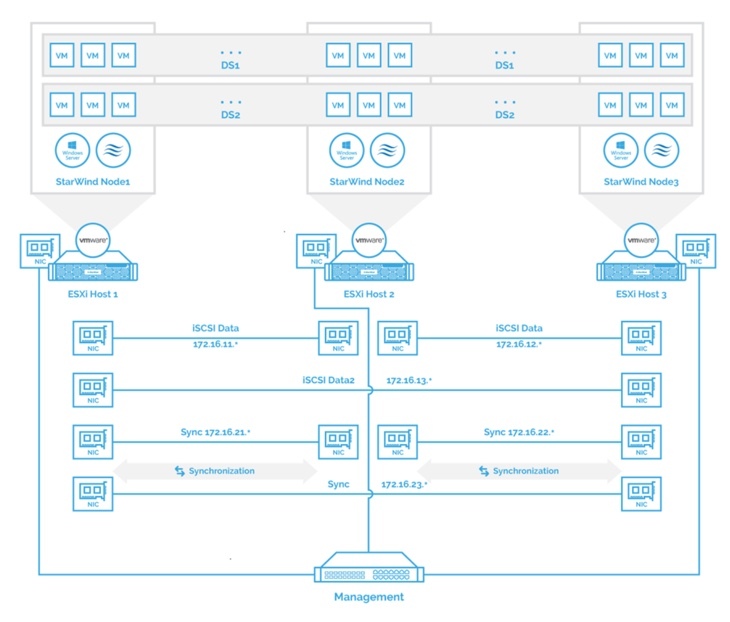 StarWind HA – The shared Logical Unit is basically “mirrored” between the hosts, maintaining data integrity and continuous operation even if one or more nodes fail. Every active host acts as a storage controller and every Logical Unit has duplicated or triplicated data back-end. No virtual tape library VTL as on the paid version. What is StarWind Deduplication Analyzer Free Tool? Worth to note that StarWind Virtual SAN on Linux for VMware vSphere has the same set of features as the one running on Windows so you can save some additional cost by replacing the Windows Server VMs by Linux. All VMs are stored on the shared storage that is provided by StarWind. VMware HA is able to assure restart of VMs in case of hardware problem and StarWind is responsible for the storage uptime. With just two nodes you’re able to create a highly-available storage which uses the local disks (DAS) of each server and creates a pooled storage exposed as an iSCSI storage visible by all hosts within the cluster. By having 3 nodes you’ll be able to handle more production workloads and in case of hardware problem, you’ll be more resilient. What is VMware Hot-Add RAM and How to use it?